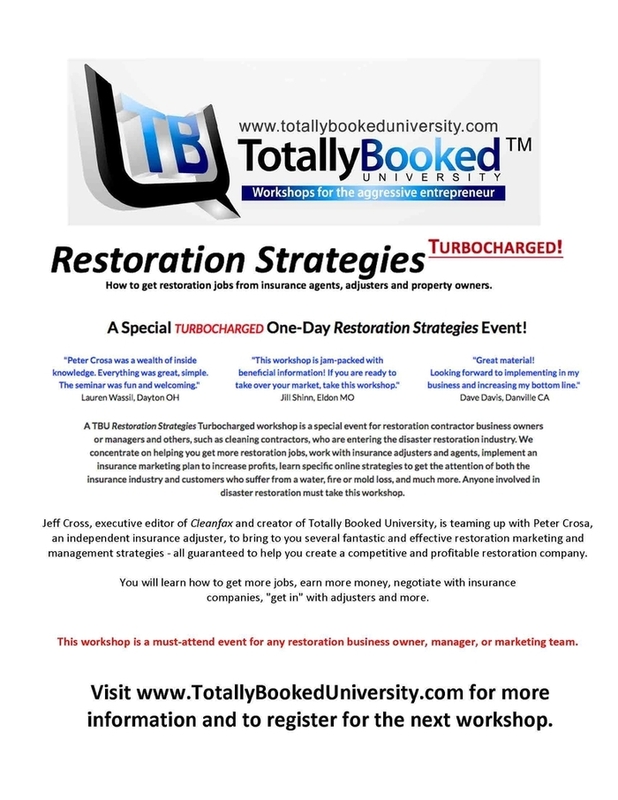 TBU Restoration Strategies Turbocharged workshop is a special event for restoration contractor business owners or managers and others, such as cleaning contractors, who are entering the disaster restoration industry. We concentrate on helping you get more restoration jobs, work with insurance adjusters and agents, implement an insurance marketing plan to increase profits, learn specific online strategies to get the attention of both the insurance industry and customers who suffer from a water, fire or mold loss, and much more. Anyone involved in disaster restoration must take this workshop. "Why do adjusters continue to try to beat me down and haggle over my methodology and pricing?" "Why do adjusters tell me there is a coverage question and - meanwhile - I am waiting (way too long) for payment?" "Why am I finding it difficult to find decent and fair adjusters who can send work my way?" "Why do I feel like the insurance industry has declared war on me, my company and the restoration industry?" "Why do adjusters keep arm’s length from me when scoping a loss?" "Why do adjusters have such a bad attitude when I was called in by the property owner?" "Why do adjusters not return my calls?" ...then this workshop is PERFECT for you! You will get the opportunity to learn how to present your services in real life situations! This frustrating problem is something many restoration contractors have struggled with for years. You do good work, have happy clients... but arestillignored by agents and adjusters. After this session, you will have an effective plan to get more restoration jobs... a plan thatreally works. Please contact Education Department with questions.